By Jim Boyce | Fu became the UK’s first baijiu bar when it opened in the spring of 2016 and the team there has served China’s national spirit in flight, infusion and cocktail form ever since. I asked a few questions about how they got started and some of their experiences. A baijiu bar in Liverpool: how did you guys come up with that idea? As a family we have been to China and seen it up close: the culture and traditions fascinate us. It interests me personally because I enjoy researching and studying spirits, and as baijiu is the oldest spirit in existence, I thought it would be ludicrous if I didn’t take an interest. A baijiu bar had never been attempted in Europe an for that reason it was a very exiting choice for us. We think there could be a huge market for it here and to be honest we really enjoy attempting to bring baijui to Western cultures. Spreading the word has not been easy but is something we know may take time. There are, after all, bars for whiskey, gin, .vodka, and even sake, but not baijiu. You guys have flights, including the People’s Flights and Emperor’s Flight? Which baijius in those flights do your customers generally like? The erguotou (Red Star) is very popular. Its origin and especially its strength gets people interested. It is also my favourite so I guess I push it somewhat. It’s savoury and smoky character is quite unique. HKB is highly enjoyed as it is aimed at the European market and quite an easy introduction into baijiu for Westerners. Moutai receives the most praise but that goes without saying. The price however makes it slightly less accessible. Fu features seven baijiu cocktails with ingredients as varied as cherry heering, yellow chartreuse,mint and vanilla. What were the biggest challenges in coming up with recipes? Obviously baijiu is unlike anything else. Its flavour profiles and aromas can be quite powerful, too, which can make it difficult. That also means it cannot be overpowered by flavours easily which with regard to making cocktails is a very good thing. As mixing baijiu into drinks had not really been explored much there was no base for us to start on. So it was trial and error for a few months. But I feel we are well into our stride and able to produce new recipes on a regular basis. I find baijiu works well with Caribbean-style flavours and lends itself to sweet tropical fruits. 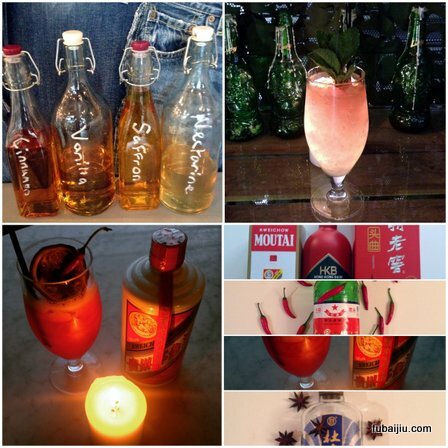 My greatest challenge was creating stirred baijiu cocktail recipes. 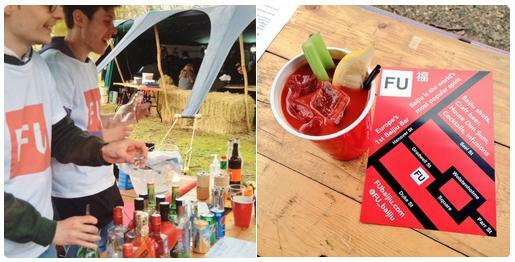 When you participate in events like Liverpool Food & Drink Festival, how do attendees generally react? The reactions are usually very positive. People are always intrigued by what we are doing and by the fact that baijiu is the world’s most consumed spirit but they have never heard of it. When people taste it for the first time they are blown away. It really is like nothing else and so alien to us this side of the world. I truly believe once you acquire the taste for baijiu it will always leave you wanting more. We have a strong base of regular returning guests drinking the same baijiu time and time again. I’m a first-time customer at Fu and I want to try one shot, one infusion and one cocktail. What are you recommending? I like to explain some history and tasting notes of different baijiu then gauge customer reactions to make more of an educated choice. But usually I go for erguotou for its dry earthy flavour. Almost like sesame. But if I know they are not into that style, I’ll go for the fruity choice of HKB or Dukang, with a ripe peach and apple kind of flavour. As for infusions, my favourite is the vanilla. I think it merged perfectly with the baijiu. It’s quite a dry vanilla taste but with some sweetness coming through. Just beautiful. For cocktails, I would advise Beijing to Bangkok, named so as all the ingredients can be found on that flight path. It is quite a crowd pleaser as it contains Japanese malt whisky and rum, almond, and orange alongside a powerful baijiu. A combination of sweet, bitter, and Caribbean and Eastern flavours. A very well balanced drink. Follow World Baijiu Day on Facebook and Twitter. And check out my China wine site Grape Walland nightlife site Beijing Boyce.